Two pressure groups have won a High Court challenge on the legality of the decision to end investigations into BAE Systems' dealings with Saudi Arabia. Corner House Research and the Campaign Against Arms Trade (CAAT) had asked for permission to seek a judicial review. They want to contest the Serious Fraud Office's decision last year to stop investigations into whether BAE gave money to Saudi officials in the 1980s. BAE, the UK's largest defence group, has always said it acted lawfully. Lord Justice Moses, sitting with Mr Justice Irwin, said "matters of concern and public importance" had been raised and the challenge "cries out for a hearing". A directions hearing will be held in the coming six weeks to decide how to proceed with the full challenge, which is expected to be a two-day hearing on a date after 28 January. The allegation investigated by the Serious Fraud Office (SFO) centred on BAE's £43bn Al-Yamamah arms deal to Saudi Arabia in 1985, which provided Tornado and Hawk jets plus other military equipment. BAE was accused of operating a slush fund to help it secure the contract. The SFO inquiry into the Al Yamamah deal was stopped in December 2006 by the government, with attorney general Lord Goldsmith announcing that it was threatening the UK's national security. BAE has since secured a giant new order from Saudi Arabia. 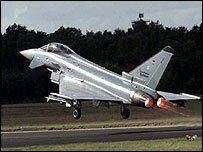 Announced in September, Saudi Arabia is buying 72 Eurofighter Typhoon jets for about £4.4bn. Corner House, a group that campaigns for enforcement of the law in overseas corruption offences, said even if national security was at risk, there was still not legal justification for ending the investigation.